When running a business you have a direction that you want to go. In order to get there you know that you need to market your business and your services to your targeted demographic. So you take out an ad, you get business cards and you build a website to represent that business. Many business owners think that they can just throw up a website by adding some content and sprinkling it with some pictures. However that doesn’t cut it in the business world. Your website is your calling card. It’s the face of your business. In many cases, your website will be the first impression that people get when it comes to your business. So what does your website have to say about you? What face is it putting with your business brand? 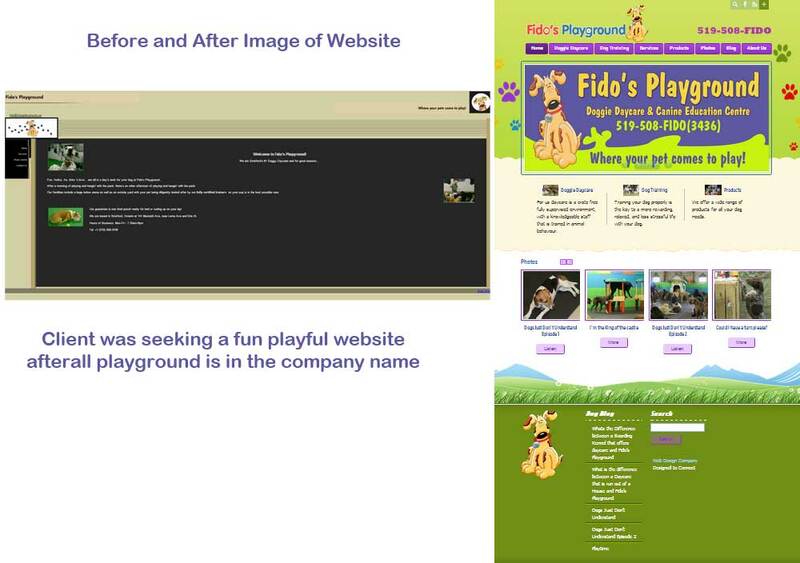 The following are 2 website examples for the same company. The one on the left is their old website they paid a developer to create the second one was the redesign of their website. How does one website over the other change the way you see the company? Before hiring a web designer be sure to look through their portfolio of work. Your website is not a static page. What it says; how it looks all reflects your business. There is so much value in your website, it will be the #1 viewed marketing tool your company will ever have. Whether you spent $5000 on your website design or $500, it doesn’t matter if what the website has to say is not a good reflection on your business, doesn’t clearly identify what you do or doesn’t convert visitors into customers. Content is king but design and optimization can mean more than the words you’ve put on the page. Don’t take that the wrong way, your content needs to be valuable and make a statement but the design of the site is important. The appearance of a site is supposed to entice your customers and invite them to learn more about your business and the services that you provide. Your website should identify what you want them to do; call us, email us, visit our store, shop online, join our email list or any other call to action. You need to compel them to want to make a decision to go with your company. In the site featured here you can see the call to action is to Book a Room. The way the website is designed will determine its appeal to all those who view it. If the design is unattractive, the flow is confusing then what you do or what you have to say won’t matter. Think of it like chocolate. When you go by a confectionary you see workers pouring the silky chocolate onto a sheet. As it pours from the crock that it’s in you see the silky flow and it looks so delicious. You stand there imagining how the chocolate will taste. It looks so creamy and tasty and before you know it you go inside and buy you a pound of creamy milk chocolate bites. That visual drew you in. If you had walked into the confectionary and a worker said “Hi, we have some good chocolate, want some?” you probably wouldn’t have bought any. Seeing it for yourself is what made you feel the need to try it. That’s the same magic and power that a website has for the businesses they represent. While it costs to build a website, its value cannot be under estimated. Once that website begins to pull in your target audience its worth becomes evident. Optimizing it so that it gets into the right hands, creating a design that lures people in and provoke them to act and adding content and search engine optimization that has meaning is what makes that website turn to gold. So take a look at your website and determine how valuable it is. Today is here and it’s the perfect time to revise your website and turn it into what you’ve always wanted it to be – a money maker for your business.